Editor’s note: Background information on the charts accompanying this article (Figures 1, 2, and 3) appears in the text below. In his State of the Union Address on February 13, President Barack Obama urged that young people be given the opportunity to obtain the skills training and education that will enable them to find stable jobs in the modern labor force and work their way into the middle class. To this end, the president proposed that high schools be better equipped to ensure a real path from school to work for non-college-bound youth. Workers from all racial and ethnic backgrounds who hold jobs in the most vulnerable occupational sectors have been affected: they face working reduced hours, taking a lower-paid position, or leaving the workforce permanently. This is particularly true for black and Latino workers, especially from disadvantaged backgrounds, who must contend with other unique circumstances that seriously curtail their ability to compete for good jobs. Historical patterns of occupational clustering in manufacturing and low-paying service jobs, for example, have disproportionately exposed them to unstable employment during economic downturns. In addition, the institutional failures of urban schools and community colleges have detracted from minority students’ preparedness for gainful employment in an advanced economy. Finally, the residential patterns of low-income black and Latino families, clustered in dense concentrations of homogenous socioeconomic, racial, and ethnic enclaves, have also affected their employment prospects. These structural and institutional conditions undoubtedly contributed to the disproportionate rates of unemployment that black and Latino males have experienced, compared to white men, since the mid 1970s. When the national unemployment average hit double digits in October 2009—for the first time in more than a quarter-century—it was major news. But unemployment among black men had already been in the double digits for most of the last several decades. Unemployment rates also topped 10 percent among Latino men during the Great Recession—but not among white males. Unemployment rates alone do not reveal the full extent of the jobs crisis affecting many low-income communities. 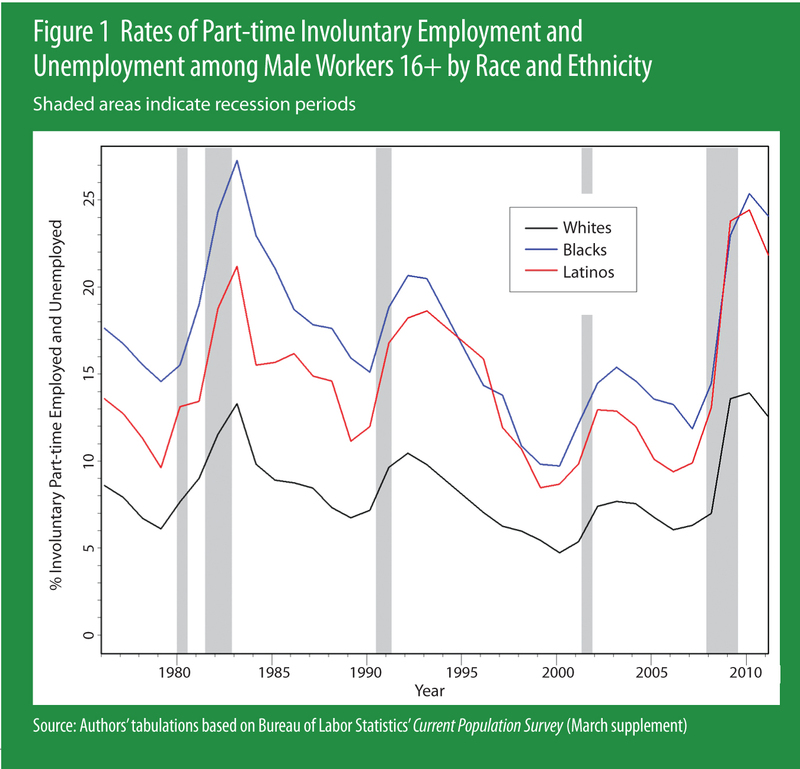 In Figure 1, we show the combined rates of unemployment and involuntary part-time employment among males by racial and ethnic group. (Involuntary part-time workers are those who would like to work a 40-hour-per-week job but have had their hours curtailed or are unable to find full-time employment.) As the data indicate, economic cycles—particularly the deep recessions that the United States experienced recently and in the early 1980s—affected rates of employment and underemployment among black and Latino males much more severely than among their white counterparts. But the problem is not merely cyclical: restoring the jobs lost during the Great Recession will still leave a disadvantaged population mired in an employment crisis. Beyond the need to create sufficient demand to get the recently unemployed back to work, we must better understand the unique problems facing minorities in poor urban communities, which require more focused solutions to the obstacles keeping them from gainful employment. Minority workers who face barriers to employment and are concentrated in specific sectors of the economy are handicapped when economic downturns or shifts in the labor market diminish employment opportunities in those sectors. 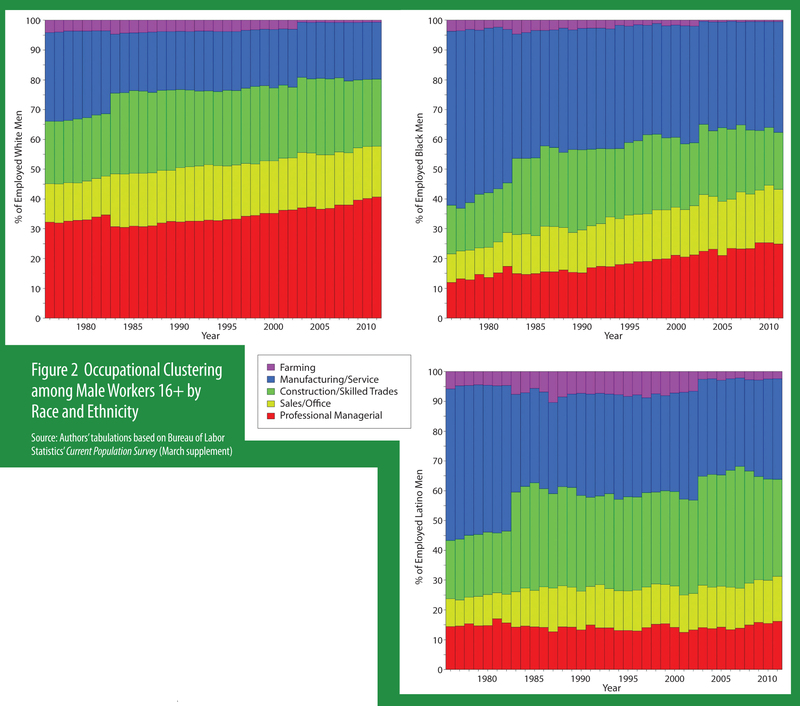 In Figure 2, we illustrate, using fairly broad categories, how the occupational clustering of black and Latino workers, as compared with white workers, has progressed for more than a quarter-century. Blacks and Latinos are heavily concentrated in manufacturing and service-sector jobs, and large proportions of Latinos are also employed in construction and skilled trades. Among blacks, the civil-rights reforms and job-creation efforts in the 1960s and early 1970s opened up better employment opportunities and helped to boost their economic progress after decades of widespread discrimination. Many of these gains came in manufacturing and goods-producing industries where black workers were already well represented. But the gains were fragile, and “middle skilled” blue-collar jobs—those that economists David Autor and Frank Levy of MIT and Richard Murnane of Harvard describe as being acquired through routinized on-the-job experience—were relocated offshore or to less-industrial areas of the country or were replaced by production-enhancing technology. The restructuring of the U.S. labor force provided fewer opportunities for on-the-job skills acquisition and pushed less educated minority workers down the earnings ladder distribution in those very sectors in which their predecessors had made inroads decades before. We also see from Figure 2 that Latinos are seriously underrepresented in white-collar occupations and over-concentrated in blue-collar jobs relative to whites. According to a 2005 Pew Research Center Report (view chart), Latinos tend to be clustered in low-paying service jobs, such as household, building, and grounds cleaning, as well as in farming and construction labor. Meanwhile, their growing concentration in these occupations coincided with expansions of lower-paying jobs in the service sector and significant immigration of Latinos, especially from Mexico, between 1990 and 2000. Language and legal-status barriers, and the lack of a U.S.-based secondary education, have severely hindered such workers who may be seeking jobs in other, better-paying industries. Although self-selection may result in some of the over-concentration of black and Latino workers in certain industries, it is implausible—given the enormous wage differentials that can separate blue- and white-collar jobs—that most people would voluntarily choose jobs that are rated lowest in terms of pay, health and retirement benefits, autonomy, and flexibility. More importantly, the status and earnings potential represented by educational attainment, particularly postsecondary credentials, have increased in importance and lucrativeness for workers even as the quality of education in poor urban schools has declined. Research shows that blacks and Latinos have demonstrated sizable gains in their educational achievements in recent years compared to white students, but their rates of high-school completion and college enrollment remain a serious concern. Official government figures showing high rates of graduation among blacks and Latinos have been criticized for, among other things, inflating these percentages by including alternative certificate (GED) holders in these estimates. A more accurate indicator is still being debated, with most researchers estimating that between 30 and 50 percent of blacks and Latinos drop out of school before the end of the twelfth grade. As for those who remain—there is strong evidence that low-income Latinos and blacks receive educations qualitatively different from those of their white peers. Not only are they more likely to be placed in classrooms with mostly other poor minority students, but they are less likely to be placed in Advanced Placement (AP) classes and more likely to be suspended or placed in special-needs classes. Consequently, it seems likely that the classroom environment and socialization children experience in racially and socioeconomically segregated schools and classrooms affect their learning in tangible ways. The dissimilarities do not end there. Blacks and Latinos are also more likely to attend a community college than a four-year, degree-granting university. Georgetown economist Harry Holzer’s research shows that, just as with high school, there are extremely high dropout rates among minorities enrolled in these institutions. And those who remain are more likely to populate remedial classes and less likely to graduate with a marketable associate’s degree. All this is unfolding as the so-called “college premium”—the financial and social benefits enjoyed by college graduates compared to those who are not—has increased considerably. Graduates from selective universities and those with advanced degrees have done well in the labor market during the past 30 years, as Harvard economists Claudia Goldin and Larry Katz carefully demonstrated in The Race Between Education and Technology. Meanwhile, the diploma holders and high-school dropouts, in particular, have seen their marketability decline sharply during the same period across all racial groups. These shifts are fueled in part by rising demand for better-educated workers at the expense of those with less. Indeed, as we show in Figure 3, the average income among bachelor’s and advanced-degree holders differs substantially from that of high-school graduates and dropouts in the same racial or ethnic group. Furthermore, differences still remain across racial and ethnic groups, even among those with similar levels of education. As the trend lines indicate, high-school dropouts do the worst in terms of annual income, with blacks generally earning less than the other dropouts, apart from a couple of brief periods of convergence. The income of white workers who graduate from high school and complete some college pulls away from the income of the other groups, with the earnings of comparably educated blacks and Latinos remaining fairly similar to each other. These differences become even starker for those who earn an undergraduate or advanced degree. Thus, a college premium does exist for all racial and ethnic groups, but white college graduates and advanced degree holders do much better, in terms of earnings, compared to their black and Latino counterparts, and this gap has widened over time. No doubt such patterns affect the kinds of friendship networks people are more likely to form, and the sorting process by which they find romantic partners. It is probably safe to assume that residential separation also affects the sharing of information about what constitutes a quality education or the pathway to a college degree. When the occupational clustering described earlier is considered, it seems likely that any leads job seekers may obtain from these networks are seriously limited to the narrow range of job categories and quality already represented in these communities. Finally, poor urban neighborhoods are also at a disadvantage when it comes to absorbing the impact of the federal, state, and local budget cuts that commonly accompany economic downturns. Layoffs in the public sector are particularly hard for blacks, who have had better success finding well-paying jobs in this sector than in private industry. But budget cutbacks also involve the loss of funding for many government-supported social programs that engage youth in afterschool activities, counsel single mothers, provide job training and employment services, keep class sizes low, underwrite prisoner reentry programs, provide healthcare, and a range of other initiatives that in good economic times are touted as critical interventions for families’ well-being. These cutbacks, combined with job instability, earnings disruptions, and general economic malaise, mean that the real impact of a recession cuts much, much deeper into the fabric of these communities in particular, and the negative repercussions can extend far longer, even across multiple generations, than official economic figures convey. Together, the clustering of full-time and irregularly employed blacks and Latinos in occupations that are unstable, low-wage, and poor quality, and the poor’s physical concentration in depressed neighborhoods introduces a more insidious segregation defined by race, ethnicity, and social class. Such patterns disconnect disadvantaged workers and job seekers from important practical knowledge and socialization experiences that are imperative for getting ahead in the modern economy. A comprehensive, far-reaching, inclusive schools and jobs initiative would help fill the chasm that hinders minority workers from acquiring or reconnecting with jobs. We now have a good deal of knowledge, much of it based on scientific evidence from randomized clinical trials or other sophisticated evaluation methods, about the kinds of educational and vocational interventions that could best succeed and under what conditions if brought to scale. For example, we know a lot more about how to structure strategic partnerships and connect training directly with jobs to bolster students’ chances of making a successful transition from school (or college) to work. In his State of the Union address, the president mentioned a fairly new high-school initiative in Brooklyn that partners with IBM to help train the next generation of workers. Similarly, major employers such as Caterpillar Inc. are partnering with area community colleges, vocational schools, and the Department of Labor to create apprenticeship programs that provide the skills training for occupations that address the company’s needs. There are other good models of such partnerships, some of which have been around for a lot longer and have undergone rigorous evaluations to test their effectiveness. Career Academies, operating out of approximately 2,500 urban high schools around the country, for instance, combine academic instruction and training targeted to specific industries in partnership with local employers. The Manpower Demonstration Research Corporation (MDRC) recently completed a comprehensive 13-year evaluation of this initiative and found strong and sustained positive effects on students’ employment outcomes, most notably in earnings, especially for black males. However, to reach a broader range of workers, such initiatives should be part of a more comprehensive and holistic employment policy, one that also takes seriously the issue of large-scale jobs creation across the entire skills spectrum, as well as the quality of those jobs. Ever since welfare reform was enacted in the 1990s, for example, considerable attention has been given to helping low-income mothers transition into employment. These efforts, coupled with a robust economy, resulted in large numbers of low-income women entering the labor force in the late 1990s and early 2000s. Since then, though, their earnings have stalled, raising serious concerns about the need for more effective career-advancement strategies coupled with comprehensive family-support systems to help bolster their career advancement. Similarly, many older white workers have been displaced from their jobs and face enormous barriers finding comparable work. Because unemployment and underemployment are linked with pervasive social problems and economic maladies that affect all workers, working- or middle-class, regardless of race, ethnicity, gender, or age, a more inclusive, far-reaching initiative would elevate the skills and job opportunities of many Americans. But poor and working-class blacks and Latinos have been on the ropes since well before the Great Recession. Without coordinated, deliberate intervention at the policy level, the outlook for their economic future is very bleak indeed. Geyser University Professor William Julius Wilson is author of The Truly Disadvantaged: The Inner City, the Underclass, and Public Policy, (1987; second edition, 2012), and When Work Disappears: The World of the New Urban Poor (1996), among other books. He directs the joblessness and urban poverty research program at the Harvard Kennedy School’s Malcolm Wiener Center for Social Policy; James Quane is associate director. Jackelyn Hwang, a doctoral candidate in sociology and social policy, is a doctoral fellow in the multidisciplinary program in inequality and social policy. The authors would like to acknowledge the helpful comments provided by Nathan Wilmers, a graduate student in sociology.